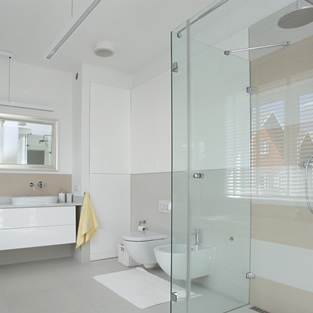 Transform the visual prowess of your bathroom while enjoying outstanding convenience and simplicity – quality Shower Screens from All Glass and Glazing tick all the right boxes. We specialise in manufacturing, supplying and fitting the market’s most elite-quality glass shower screens and doors, bringing that perfect balance of form and function to the modern bathroom. Visually stunning, uniquely effective and supremely easy to maintain, it’s a small addition that can make an enormous difference to the home. All Glass and Glazing takes enormous pride in manufacturing bespoke glass shower screens to the exact specifications of our customers. Regardless of the size, shape or finish you’re looking for, we’ll work tirelessly on creating the products of your dreams for prices that simply cannot be beaten. The list goes on, but each entry further solidifies the universal appeal and value of contemporary glass shower screens. As a family-owned and operated business, there’s nothing in the world that matters more to us than the genuine satisfaction and delight of our clients. We approach every job as if we were carrying it out for ourselves and back every product/service we offer with a whole catalogue of guarantees. What’s more, as a totally independent brand we’re uniquely able to offer 100% impartial and objective advice for the benefit of you and you alone. All quotations are cost-free and obligation-free, so why not give us a call to discuss your home improvement project? For more information on our shower screens or to discuss a quotation, give the All Glass and Glazing team a call today on 0161 427 7800.